This isn’t a fully-comprehensive guide to every single budget-friendly eatery in the capital. Nope. This is a small selection of just some of my favourite cheap eats, without skimping on quality. If you’re in the area around Ningxia nightmarket, then look no further than this delicious oyster omelet. Portioned up off this gigantic one, the oyster omelet is a staple favourite for many, me included. At $50, you can’t go wrong! Or, maybe you want a filling breakfast? This will definitely get you through the day, and you’ll still get change out of $300. I’m not a fan of Ximending. But, when I do go there, I try to go here if it isn’t too busy. Everyone loves that #yolkporn, especially at $25 (+$10 for the egg). 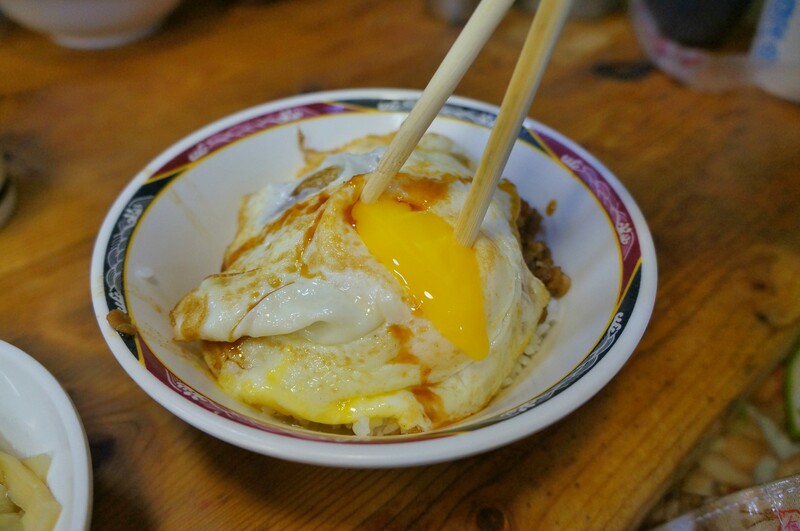 The rice is borderline, but the delicious meat and gooey egg make up for it. Under $50/bowl. Looking to eat cheap with friends? You can get a bit of everything here, and still have change out of a $500 for everyone included. The rice will set you back a mere $30, and the soup with noodles inside will set you back $80. Add a side of veggies ($35) or tofu ($30) and you’re laughing. Since I wrote this post, there’s now another restaurant in this chain opened in GongGuan. This Hainan specialty chicken with rice is only setting you back $145. Whilst this spicy chicken with rice, eggs, and shrimp crackers will set you back $149. You’ll easily get change out of $200 for two bowls of rice noodle soup and a plate of deep fried oysters, here. And, you’re set to go get a bowl of delicious shaved ice at Summer Tree Desserts, after. $90 for a bowl of this monstrous, delicious congee, and $110 for a bowl of noodles with pork liver is going the right way. This place is really solid, and even though it’s in the Eastern (can be more expensive) Area, it’s a good find. $60 for this?! I’m all in! They also do some really good curry pot stickers, too. At $50, this will absolutely not disappoint. Delicious. If seafood is your thing, then this fresh squid will tick your box. It’s $120, which may not strike you as cheap, but the freshness and quality of this will make it seem like a dream! You get a big bit of pork stuffed in this bowl, with a delicious warming broth, all for $70. As I said before, this is not every single inexpensive eat in the Taipei area. But, it’s a selection of a few of the delicious ones I have had the pleasure of eating, so far.